Soaprise.me is a small family-run business which supplies a large variety of natural bath treats. 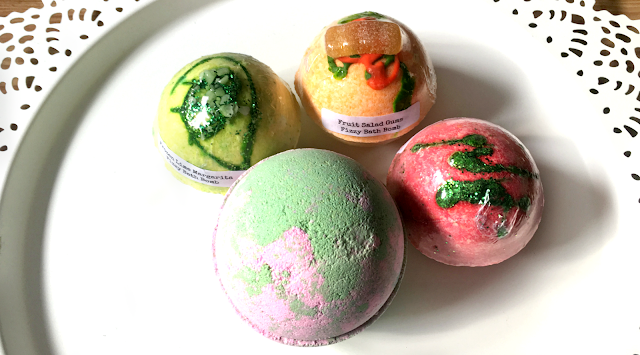 Their online store holds a wide range of bath bombs, soaps, bath salts and more. In the not so distant future the Soaprise.me team are hoping to add a range of bath hampers too and they very kindly sent me one to me to try. The hamper I received contained a selection of bath bombs (Strawberry Daiquri Fizzy bath bomb, Frozen Lime Margarita Fizzy bath bomb, Fruit Salad Gums Fizzy Bath Bomb and a Retro jumbo bath bomb), a slice of Jojoba Olive Oil soap, three mini heart soaps (two Green Tea scented and one Coconut scented), a set of three mini soap flowers (Lavender scented) and a Coconut and Lime solid shampoo bar. The hamper was delivered in a sturdy cardboard box, filled with shredded paper which helped to keep the bath treats in tip top condition during transit. Most of products within the hamper came individually wrapped (the exception being the mini soaps). 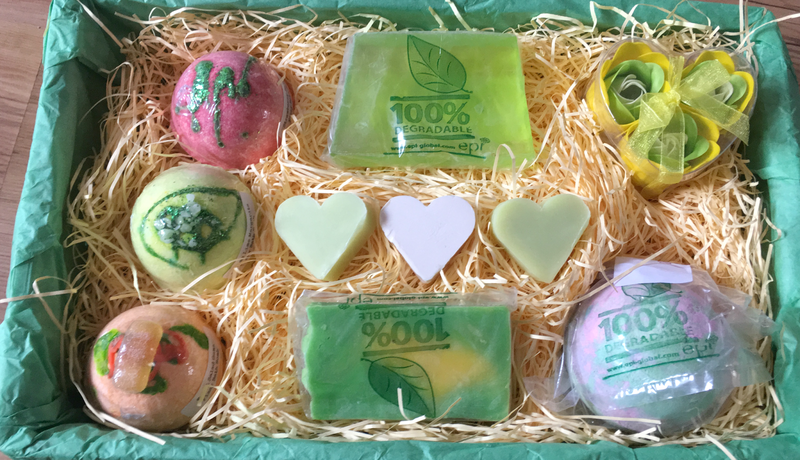 I was very impressed to find out that Soaprise.me use cardboard boxes made from recycled cardboard (or cardboard from sustainable sources), biodegradable bags for their bath bombs and biodegradable wrappers for their soaps. I was pleasantly surprised at the amount of products in the hamper. However I think it would be nice to have a card/booklet within the hamper giving a little bit more information about the products (e.g. ingredients, how to use etc). As there were so many bath bombs in the hamper I enlisted the help of my Mum to help me try them out. We both thought that there wasn’t very much scent in the smaller bath bombs although the jumbo bath bomb had a stronger scent - however the scent of 'Retro' really wasn’t my cup of tea. The bath bombs we tried did give off lots of colour without leaving a stain around the edge of the bath - an added bonus. At this point I think it's important for me to mention that the bath bombs from Soaprise.me are significantly cheaper than LUSH bath bombs (and slightly cheaper than Bomb cosmetics bath bombs too). It's great to have more budget friendly bath treats on the market, however for me these bath bombs don't quite match the quality of competitor products just yet. The mini heart soaps make a very cute addition to the hamper! I wasn't very keen on the scent of the Green Tea scented heart soap (although I'm not the biggest fan of green tea) but I thought the Coconut scented soap was quite pleasant. The mini soaps didn't create very much lather, but came in very handy as handwashing soap. Seen as I like my reviews to be 100% honest I don't feel like I can say much about the Jojoba Olive Oil soap as I really didn't like the scent at all so I didn't give this product a fair trial. One thing I did notice about this soap was that it lathered up more than the mini heart soaps, so would work well as a a body wash. The lavender scented mini soap flowers had quite a light scent, which I found to be very pleasant. Whilst visually the flowers did look impressive, they were my least favourite product from the hamper as once I had popped them into the bath water they became almost slimy to the touch. My favourite product from the hamper was the Coconut and Lime solid shampoo bar, which had a lovely fresh scent! I found that this product lathered up very well (once applied to damp hair) and left my hair feeling squeaky clean. I think this would be a useful product to have to hand when travelling and I would consider purchasing this product again.